Print dazzling, image-intensive documents and impressive brochures and flyers when you use this thick matte paper for laser printing. This ultra-smooth, professional-weight 200 g/m2 paper is ideal for bold color prints that look and feel impressive. Create professional-quality marketing materials without leaving the office. 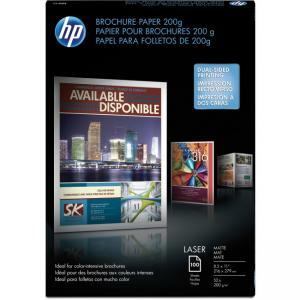 Matte brochure paper is designed for Hewlett-Packard Color LaserJet printers and features increased brightness for breathtaking, vivid photo and image quality with unmatched consistency and reliability from start to finish.